My fascination with the .22 started at a young age. The first gun I remember shooting was a High Standard 103 Supermatic Tournament. At the age of 5, I was too young to handle it myself, but had the opportunity to get started in a sport that has stayed with me. Under close supervision, the gun's weight was supported for me, and a watchful eye kept my hands clear of the slide, while I did the aiming and pulled the trigger. Ten rounds didn't last long and I'm sure I immediately said, "Let's do it again!" I had not done much shooting since moving to Phoenix in 1995. Other hobbies such as flying had taken my interest and at best I shot a couple times a year. The interest caught up to me again two years ago in 2002. 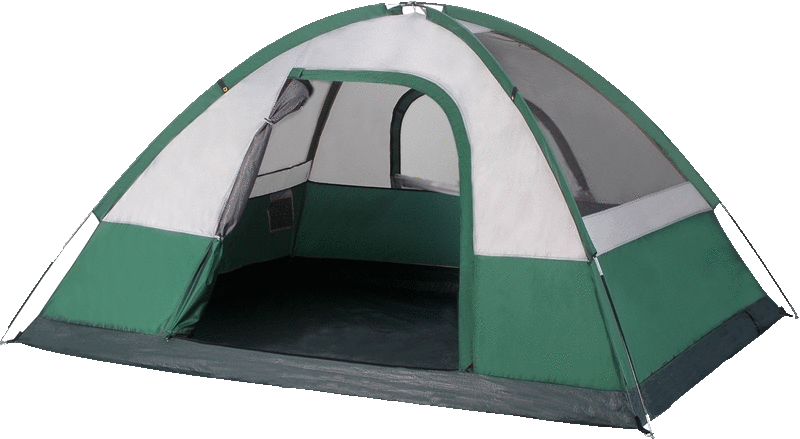 When I became interested in joining the Honeywell Sportsman club, it was because the BR-50 match caught my attention. The Winchester 52D which was my dad's hadn't been shot in over 25 years, and I had wanted to see what kind of accuracy was possible with it. While I was at it, the .22 Pistol Silhouette match looked like a good challenge also. For those unfamiliar with the BR-50, it is shot at 50 yards and the object is to hit within a ½" bullseye without cutting the line, which is worth 100 points. If you hit outside the bullseye but within a ¾" circle, you get 50 points. Outside of the ¾" circle but within a 1" circle is 25 points. Unlike standard 10,9,8 . . . scoring, the penalty for missing the bullseye is at least 50%, and to get inside the bullseye you must hit no more than .138" from the target center. 25 shots are fired at each of 25 targets for each round of the match, for possible score of 2500. Accuracy and repeatability are necessary to score well. I started with getting as many types of .22LR ammo as I could find and testing each to see which worked the best in my rifle. My first round of testing produced inconsistent results. 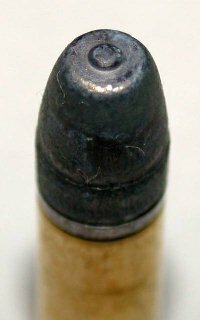 Ammunition of the same bullet weight and very similar advertised muzzle velocities had different vertical points of impact at 50 yards, however, group size gave some indication of which grouped the best. I had hoped to find an inexpensive ammunition that worked the best, but in general, the more expensive ammo worked better. The primary goal was to find the most consistent and best grouping ammunition. Second was to hopefully find a low cost alternative to practice with that had similar ballistics, and third, to find something that would work well in the Ruger MKII for pistol silhouette matches. While preparing for the second test session, I found that the rifle barrel was touching the preload screws in the stock forend. I had checked for clearance with the rifle muzzle up, but in the shooting position, the screws were just touching because of flexing in the stock and barrel due to the weight of the gun. One turn out on each of the screws and the barrel was free floating as I had intended. This time the results were much more consistent, most of the vertical difference between loads was gone. 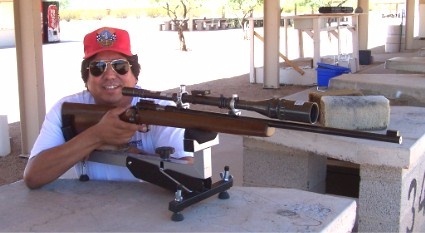 I was also getting the feel of the rifle and becoming less of a factor in the test results. The final contenders are shown in the table below. Also tested were Aguila SE, CCI Pistol Match, Remington Target, Winchester Supreme. Most of these gave good groups, but produced more flyers and were less consistent from group to group in my gun. What I considered to be the best & most consistent are listed below. All are results at 50 yds. Aguila Match Pistol .46" .51" .485"
Lapua Master M .20" .46" .330"
Lapua Midas L .26" .31" .285"
Lapua Midas M .19" .47" .330"
I did one more test after receiving my order of Eley Tenex, and compared it to Lapua Midas M. Eley Tenex EPS has a unique bullet design which is supposed to be affected by the wind less than standard bullets. Lapua Midas M .32" .51" .30" .377"
Eley Tenex Ultimate EPS .26" .44" .23" .300"
After some practice, I could not tell any consistent difference between Midas L and Midas M. Master M was similar to Midas, but produced slightly more flyers. Midas was about $10 a box, Master about $5.50 a box, and Aguila Match Pistol about $2.20 a box. The difference between Lapua M and L is the diameter, M is .223" diameter and L is .224" to tailor to different barrels. 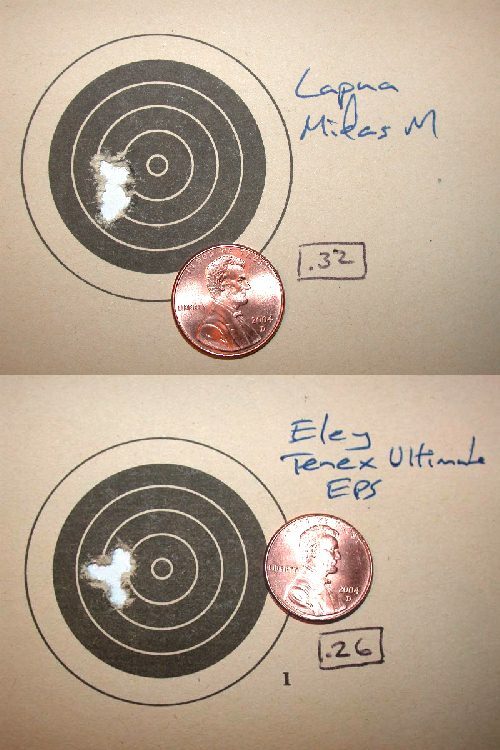 I settled on using Midas M or Eley Tenex Ultimate EPS for the BR-50. In practicing for my first match, I scored slightly higher using Midas M, so that is what I used. The Aguila Match Pistol had good accuracy and functioned well in all my .22 auto pistols, so that has become my standard pistol ammo. During practice and in my first match, I noticed that I had some vertical dispersion that I could not account for. My rifle has a Unertl 24x, which is an external adjustment scope, so I cleaned the scope suspension points, which helped some, but didn't completely eliminate the problem. When practicing for my second match, I was shooting in a 5-10 mph crosswind that progressively increased throughout the morning. I was making 1.5" corrections to compensate for the wind and was having trouble keeping the shots going where I wanted them to go vertically. The wind was left to right, and I had to adjust the scope since I was shooting low. 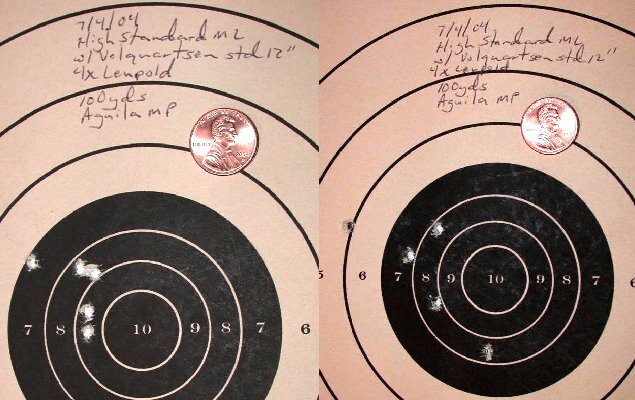 I had been shooting Lapua Midas M, and decided to try the Eley to see how it did in the wind. WOW! With the same wind, I only had to correct about .75" - the unique nose on the Eley really is affected less than a standard round nose. Some, but not all of the vertical dispersion was gone. It's a lot easier to drift a shot into a .5" bullseye with a smaller correction, so I decided that if it was windy on the day of the match, I would use the Eley, and if it was calm, I would use Lapua. Well, it was windy for the match, and this time the wind was from the other direction - right to left. At first I thought that I was having scope problems again, since my sighters told me I was shooting higher than on the previous day. I cranked the scope to bring the group down. The first two rounds of the four round match did not go as well as I had hoped, and I tried checking the scope to make sure it was returning to position correctly, since it can slide in its mounts against a recoil spring. Then just at the end of the second round, I tried a sighter during a wind gust. I noticed that not only did it drift more, but it was also higher than any of my other shots. Adding some vertical correction gave excellent results. I found that instead of correcting for the wind at the 3 o'clock position, that if I corrected at 4:00 to 4:30 o'clock, I could consistently stay near or in the bullseye. My scores for the 3rd and 4th rounds were significantly better than the first two. After getting home, I did a search on the internet, and found a couple of websites that explain this phenomenon, which is due to the gyroscopic precession of the bullet caused by the force of the wind. What I was seeing is common for right hand barrels where the bullet turns to the right from the point of view of the shooter. The opposite occurs for a left hand barrel - its groups move left and down, or right and up in a crosswind. My other project has been to put together a .22 pistol combination which would give 1" or smaller groups at 100 yards from the bench. The first setup I have found that will do this is a Volquartsen 12" carbon fiber tensioned barrel on a High Standard Victor frame and a 4x Leupold scope. 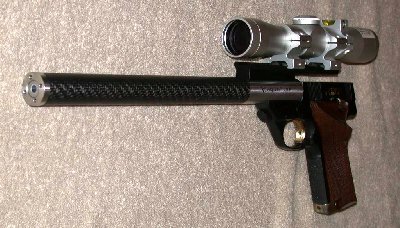 The photo to the right shows the carbon fiber sleeve and round nut on the muzzle with spanner holes to provide for tensioning the barrel. The left target in the target photo below shows a 5 shot 1" group at 100 yards, which was shot with no wind. The left target in the photo below shows another 5 shot group at 100 yards with the wind variable. This shows the group, still about 1" wide, but strung at approximately a 45 degree angle due to the wind. I have enjoyed working on improving my accuracy with these .22s. I have found that in my selections, getting quantities of ammunition from the same Lot# that is consistent has helped me to improve. At some point I will probably do some selection within an ammo Lot# based on weight or size to see if a further improvement can be made. One question at a time I hope to get better at this game, and help those I shoot with do the same, and have a whole lot of fun doing it.